Over the last couple months, several veteran competitors stepped into the Octagon with questions about their future in the cage swirling overhead and came away with mixed results. Some were stopped by younger, ascendant foes, leaving them no choice but to continue to address the questions, while others, like Diego Sanchez and Jim Miller, made good on their pre-fight declarations to get back into the win column and prove that reports of their demise have been greatly exaggerated. 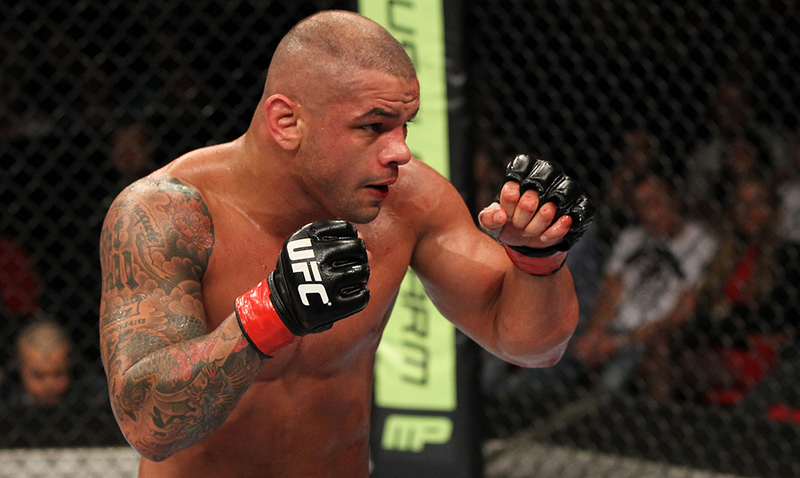 This weekend, as the UFC makes its maiden voyage to Russia for a card at the Olympic Stadium in Moscow, Thiago Alves is the one being asked the questions about his motivations, his recent struggles and how much longer he believes he’ll continue making the walk into battle. Just a few weeks shy of turning 35, the former welterweight title challenger knows that he’ll have to make the transition to coaching full-time in the next couple of years, but right now, he’s feeling better than ever and eager to get back to work at his first job. “Coaching is my second job,” says Alves, who returns to action this weekend against Aleksei Kunchenko in the opening bout of Saturday’s main card. “My first job is still to be a professional MMA fighter. I’ve been a professional MMA fighter for as long as I can remember. “I’m going to be 35 and I’m thinking I probably have another year or two in me and then I want to start the next stage of my career, but make no mistakes: I’m in it to win it and I’m going to come forward and make it bloody because I know it’s not going to last much longer. It has been a frustrating last few years for Alves, as injuries and unforeseen circumstances have limited him to just three appearances over the last three years. After an attempt to move down to lightweight went sideways and resulted in a unanimous decision loss to Miller, the Brazilian veteran rebounded five months later, collecting a decision win over Patrick Cote in what turned out to be the final fight in the French-Canadian fan favorite’s career. 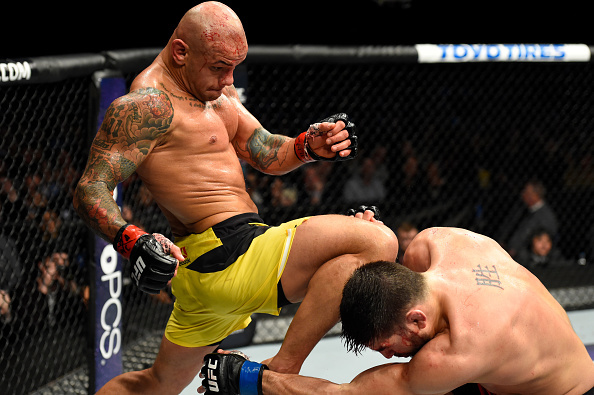 The momentum of that promising start to 2017 was lost once fall rolled around, as Alves was forced to withdraw from a scheduled bout with Mike Perry in September after Hurricane Irma tore through Florida. He and his family spent a couple weeks living in the gym, and on one of his trips to check on his home, he discovered his English bulldog Tank had passed away in the chaos. Four months later, Alves was in St. Louis, ready to lock horns with southpaw Zak Cummings when the former Ultimate Fighter contestant slipped in the bathtub while cutting weight, scuttling the fight at the 11th hour. “Four weeks later, they give me a guy that is completely different – a guy that nobody really knows about, but who is a talent,” says Alves of his February clash with Curtis Millender in Austin, Texas. “He’s a very tall, very lengthy striker and I didn’t have much time to prepare and you saw the results. 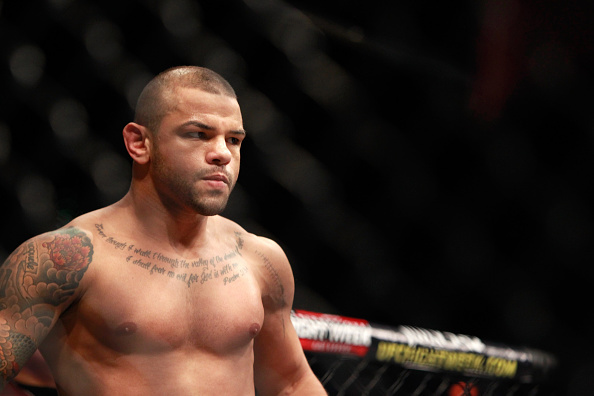 As one of the longest tenured fighters on the UFC roster, Alves could have probably lobbied for an opportunity to fight a little closer to home or pushed back on being matched up with a promotional newcomer, but that just isn’t his style. From the time he made his promotional debut in October 2005 against Spencer Fisher and through the next 22 fights that followed, “Pitbull” has been happy to face whomever the organization puts in front of him and slug it out wherever he’s needed. “I’m fighting a newcomer, but I’m old school – my job is to fight and it doesn’t matter who it is, I’ve got to go out there and I’ve got to win. And winning is the only thing on his mind at the moment. “I have a lot of love for my Russian fans and my Russian friends and I’m excited to see Moscow, but we’re going for war, so I’m going to go there, dock my ship and then burn my ship so that the only way I can come back is by stealing his ship and coming home with it,” says Alves. “That’s the mentality that I have right now. I don’t really think about where I’m at and where I’m going to be after because I know my job is to go to Russia to get a win.